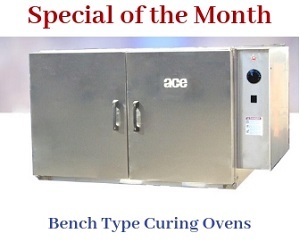 The ACE Model 280 RT burn off oven can be considered as a sister model to the 270-RT. The reason for this is that both ovens have similar features and specifications. This oven comprises 2 primary burners, and one afterburner. The primary burner flame is confined to the combustion chamber. It only heats the chamber to 800°F, and never touches the parts. This high level of removes contaminants and any volatile materials as smoke. The afterburner supports the cleaning process by eliminating the pollutant filled smoke. The specification tables below will give you a better understanding about the oven’s technical design. Volume Over Cart 464 CU. FT.
Our burn off oven model 280 is safe and efficient for cleaning industrial parts of different shapes and sizes. It is ideal for sensitive reject parts such as sheet metal made from steel and aluminium. This model’s design and specifications adhere to the regulations of UL and ISO. We can also provide models with adherence to FM NFPA.